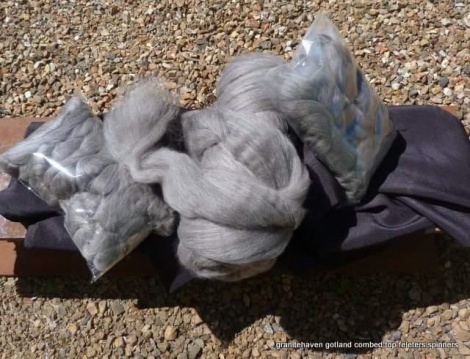 100g pack Combed Top for spinning. Australian grown by Granite Haven Gotlands in Victoria, scoured by Velieris in Melbourne and processed by Cashmere Connections Pty Ltd at Bacchus Marsh. Superb long stapled fibre suitable for lace to art yarn. Mid pearl grey achieved through a blend of greys and white fleeces. A truly unique Australian fibre.